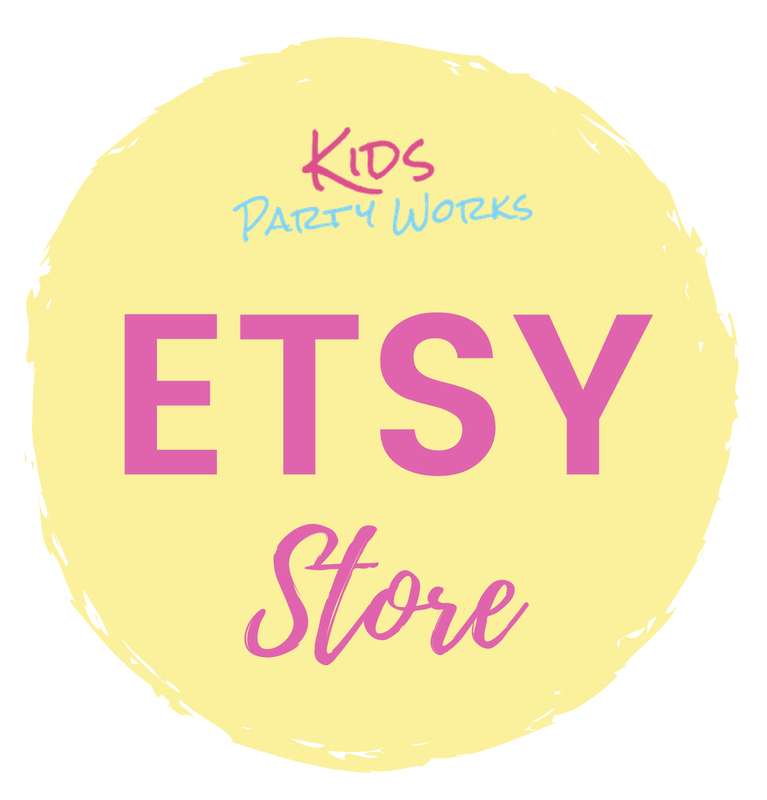 If your having a TinkerBell Birthday Party or a Pixie Hollow Games Party then get ready for some fantastic and “super-fun” games for all ages. On our list of more than 20 TinkerBell games, you will find everything from Treasure Hunts to Music Games to have an awesome Tinkerbell Party. Although we start the party experience right from the beginning with the invitation, this is the part of the party that is the most fun (along with the prizes). Part of a kids great birthday parties is the entertainment and what better way for kids to have fun than by playing party games. Whether you're looking for quiet or active games, games for toddlers or older children, musical games or relay races, we have something for everyone. Plan your party with at least 2 or 3 games, keeping in mind the age group of your guests and the length of time of your party. Note - IF you are planning on having prizes, there should be a prize for everyone. If there are only prizes for a few, then the party becomes a competition and a child’s party should be fun for all. At our birthday parties everyone was a winner and it doesn’t take a lot to make a child smile. For a couple of dollars you can have prizes for everyone. Look for things that come in a pack, like rings, barrettes, playdough, bouncing balls, etc. For example, most dollar stores sell gemstones (pictured), which come 12 to a pack. So for $1.00 you can have 12 prizes (they are like mini moonstones). There are also princess skirts and princess shoes, butterflies and TinkerBell Activity Sets, all for $1.00 each. Explain the rules and safety instructions to all your guests. If they are going on a hunt, show them what they are supposed to be looking for. Before each TinkerBell game explain “How to Play”. You can have a board showing all the Pixie Hollow Games they will be playing. If you’re not having prizes, the winner of each game can pick the next game to be played. She/He can be the one to mark off the game she/he just won. If you are having prizes, let them know that everyone will be a winner. Our rule was – If you win a prize, you can keep playing but the 2nd place winner gets the next prize; everyone left with a prize. Or you can give “little” prizes to the guests that have already won “bigger prizes”. At our house, we had so many children (30 to 50) at times that we just had a Prize Table and as children won they would go to the table (with an adult) and choose a prize. If you’re having more than a handful of children, designate an adult to be the “Prize Giver” so you can attend to your guests. Great kids birthday parties include fun games for everyone. Below are many different TinkerBell Games for all ages. SomeTinkerBell Games are more appropriate than others for the "little ones". There are some games that are great for girls and boys. There are gentler games, active games, games for younger guests and games for older guests. Review your guest list and choose games accordingly. Use a butterfly board (like in the Pixie Hollows Games movie) to keep score. Cut a rectangular board (about 24 inches long and 4 inches wide) out of cardboard or poster board, use different colored butterflies ($ store), each color to represent a guest or a team. Winning team or guest is at the top. 1. Frog Race - Like in the Pixie Hollow Games movie. Mark a starting and finishing point. If it's outside, use colored masking tape to mark the starting line and the finish line. If your guests are little, have them line up on the tape and do frog jumps across to the finish line. Everyone is a winner, so the first one across gets her/his prize first, then the second winner and so on. If there are no prizes then the winner gets to pick the next game. Added fun - have them wear green socks or gloves on their hands and 2 or 3 spots (made with colored construction paper and double sided tape) on their backs. Play an upbeat TinkerBell Disney Fairies song while they are playing for added fun and atmosphere. 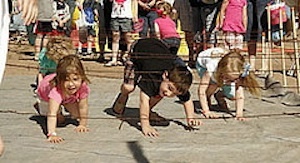 Leap Frog - Older guests can play leap frog where the set up is the same as the frog race. Have one jump over the other until they reach the finish line. Pair your guests, if you have an odd number then perhaps there is an older sibling or adult that is willing to participate (no one with bad knees please). Adult should walk with legs apart over child and not put any weight on child. Picture courtesy of MDGovpics. 2. Tinks Hunt - Hunt for pixie dust (glitter or gold confetti). Place pixie dust in small pouches (Michael's sells chiffon pouches with satin ribbon in packs in the bridal section) then place pounch inside or tied to a large plastic "fake" flower ($ stores - can get 2 to 6 flowers for $1.00). 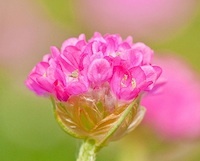 Hide the Flowers around the party area and have guests hunt for them (one flower per guest). Have an adult accompany the little ones or have Queen Clarion, Fairy Mary, Peter Pan or Captain Hook (an adult) read made-up clues on where to find the pixie dust. If your guests are all "little", place a fairy cutout (print TinkerBell and her fairy friends) near the flower so it's easier for them to find. Remember that little ones eye level is not the same as ours, so hide flowers in places that are easy for them to find. Picture courtesy of Flickr-Steven-h.
3. Fairy Hunt - Budget Friendly TinkerBell Games Version 1- Print Fairies and/or Sparrow men from online sources. Print on cardstock or you can print them on paper and then glue them to cereal box and cut out. Disney Fairy Exclusive Figurine 6Pack Version 2- 6 fairies for $19.95 at places like Amazon. 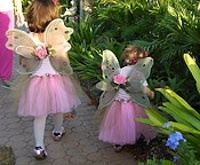 Hide Fairies around the party area and have guests hunt for fairies. Make sure you have one for every guest. 4. Walk the Plank Version 1 - Of all the TinkerBell Games, this is a favorite of children both girls and boys. Begin by purchasing aqua blue vinyl tablecloth in the roll( sold at party stores) and tape 2 long sheets of blue tablecloth together to make the "sea". You can decorate the sea with shark fins (cut from black construction paper) and other sea creatures. Place a long board or tape in the shape of a plank on top of the water (blue tablecloth). Blindfold the older guests and have them walk the plank. Little ones can do it without the blindfold but if they insist on being blindfolded, have an adult hold their hand. Place 2 inflatable alligators or make 2 out of construction paper and place at along the sides near the plank. If guests get to the other side of the plank without touching the alligators or falling, they win. Have guest jump off the plank to receive their prize (eye patch, pixie dust, gemstone, ring, etc.). Walk the Plank Version 2 - same as above put place the 2 alligators at the end of the pond in 2 different places. Guest must jump off the plank and into the "water" without touching the alligators. Picture courtesy of Flickr - TomHiggins. 5. Magical Chairs - Played like musical chairs. Line up chairs one facing one way and one chair facing the other way with one chair for every guest. Play fun fairy music and when you stop the music everyone runs to sit down. Whoever is left without a chair is out. Give a consolation prize, take away one chair and play again until there is only one child left. Picture courtesy of flickr-Loren Javier. 6. Tink's Moonstone Treasure Hunt - First you need moonstones... "What are moonstones and why do we need them? you may be asking. 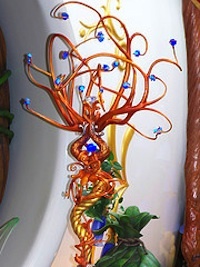 In the movie TinkerBell and the Lost Treasure, TinkerBell is chosen to make the Fall scepter. She is given a moonstone, which is quite rare, to place on top of the sceptor she will build. The moonstone breaks and she goes in her cotton-ball air balloon to try to fix it. We won't spoil the ending (in case you haven't already seen it 100 times) but it's a happy ending. What we call moonstones are actually the white pearly stone in the first picture below, but our little ones don't know that, so, you can use the dollar store "Gems" which are quite pretty and come in different colors. Shown in green and blue in the picture below. 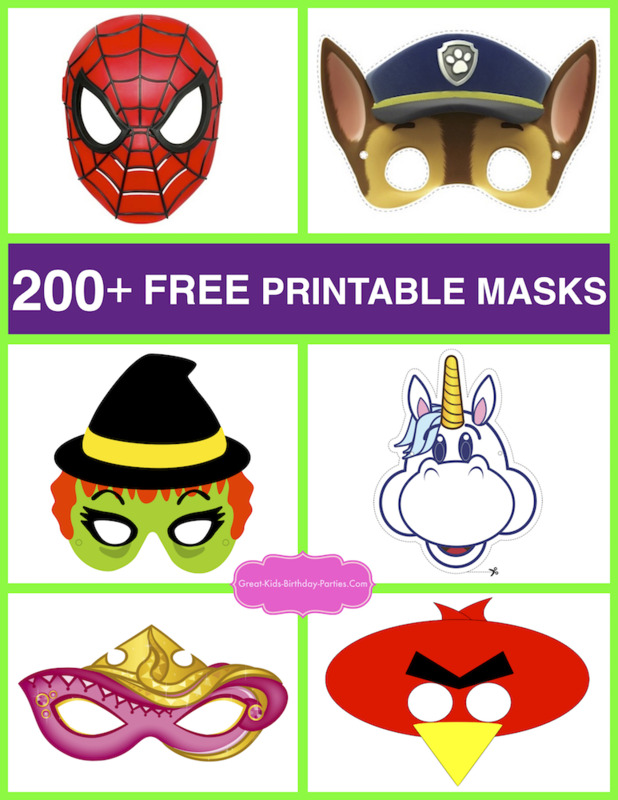 These are great for a treasure hunt or for prizes during your TinkerBell games. The picture to the right shows TinkerBell's scepter from the movie. Safety Warning - These are small round objects and not intended for very young children. Read the warning label on the product before using. Use balls the size of tennis balls or larger for the very little ones. Picture courtesy of flickr-Loren Javier. Giant Orbs In A Jar - Giant jelly marbles that grow in water to the size of about a tennis ball. They come in a variety of colors and come in a jar of 50 orbs for $9.99. These are one of the most budget friendly and fun. However this is not for small children. WARNING: CHOCKING HAZARD - This toy is or contains a small ball. Not for children under 3 years. This is the website where you can read more about it. http://www.stevespanglerscience.com. Enormous Glass Marbles - These marbles are beautiful and the enormous marbles are almost 2 inches which is big enough to look impressive...like a moonstone. Look carefully at the prices, because they are sold by an English company and their prices are in pound sterling so the prices we are writing here are slightly higher in reality. Prices range from $1.20 to $175.00 (I'm thinking we want to stay in the lower range) so if you decide to purchase any marbles from this website triple check the price first. They have some beautiful ones for about $2.00 to $4.00 range. Look at the enormous ones first which are 50mm (almost 2 inches) and then look at the massive marbles which are 42 mm. There are some beautiful ones in this size which is about 1 1/2 in size. There is also shipping and handling to consider so you need to factor this in as well. LED Acrylic Juggling Balls- These are very impressive however they are also quite pricey, about $14.00 or less if you buy in bulk. Do a Google Search for "LED Acrylic Juggling Balls" and research. Guests go in search of moonstones (like an Easter egg hunt). This is best for little ones. Older guests can be given written clues. Each guest receives her/his individual set of clues to find their moonstone. Older guests can be given a compass to find their individual moonstone. If using the gems, then when guests find 3 of the same (or not the same) gemstones, they can run back and receive a prize. This is one of the TinkerBell games that your guests will really enjoy because the hunt if so much fun and a beautiful moonstone awaits. Happy Hunting! 7. TinkerBell Tag - This game is played like regular tag but with a twist. 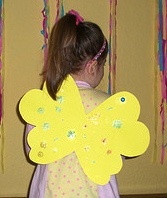 First make a set of mini fairy wings about 16 inches wide, from a lightweight material like construction paper (pictured) or thin felt. Use double sided scotch tape by placing long strips both across and lengthwise. Pick one person to be "It" and that person tries to tag the other guests. When they tag someone they have to say "I believe in fairies" and the wings pass on to the person tagged. Allow all guests to be "It" if possible. Picture courtesy of flickr-seelensturm. 8. Fairy Tale Theater - Let's Put On A Show! Put on a play using the characters from the Tinkerbell movies. There are plenty to choose from for both girls and boys of all ages. Make ahead some easy and quick costumes and props using construction paper and felt. Make things like tiaras, wands, fairy skirts, wings, Peter Pan hats, felt boots, etc. "Terence and Blaze are with her"
"Wow! the scepter is beautiful"
And remember what every actor lives for..........Applause! Below is a list of Tinker Bell Friends. There are plenty of characters and an unlimited amount of fairies, sparrow men and creatures that your guests can become. Make it short and interactive, so that all guests have an opportunity to perform. For example have everyone going to the Pixie Hollow Games or you can separate your guests into groups and act out some of the Pixie Hollow Tinkerbell games. Games like frog jumping or car driving or flying teacups. There is a lot to choose from. Watch the Tinkerbell movies for inspiration. 9. Volleybug – This is one of the TinkerBell Games played in Pixie Hollow Games, the movie. Take halloween spider web and stretch it out between 2 trees, bushes or poles. The "web" is so light that you can even tape (masking tape or electrical tape) it to just about anything. This will become you volleybug net. In the movie they use rolled up bugs as the ball, so you can have your pretend bug ball buy inflating a beach ball ($1.00 at the dollar store) and painting it grey and tan and drawing eyes and antennae to look like the volley bug. If your ball has white or yellow colors like the balls pictured, leave that part without painting grey and draw the face on that piece. Look at a picture of the volleybug from the movie as a reference when painting. There are different size balls so keep the ages of your guests in mind when purchasing the ball. Picture courtesy of flickr-Alaska Dude. This game is played like volleyball with no strict rules. Each team gets a point when the other team misses the ball and the team that gets 5 points first, wins. But everyone is a winner so maybe you could have regular prizes for the winning team and small prizes for the other team. If you are not giving out prizes then the winning team get to pick the next game and can mark off volleybug game on the butterfly scoreboard (if you're using a board-see paragraph above "frog race"). 10. Pixie Hollow Games - Let the Games Begin! Invite guests to go from "event" to "event" (like the Olympics), earning points as they go along. Picture courtesy of photobucket-pixie venus. Begin by having guests color the 6 flags or you can make them ahead of time by taping 4 pieces of colored construction paper and then cutting out the shape. Glue onto a dowel or paint stirring stick and display them at your Pixie Hollow Games. Normally we would say "Let the best team win", but this is a birthday party and everyone should be a winner. At our parties we use to tell the children that they were not competing against one another so just to have fun and do their personal best. Give every guest a "pixie five" (same as a high five) and their prize as they complete the games. If you're not giving prizes (and thais is fine too), you can give each child a Pixie Hollow Games Certificate of Achievement. You can download this free Disney printable of the TinkerBell Games certificate at family.go and type "certificate of achievement" in the search space. The certificate is a really cute green maple leaf shape where you can write each child's name. 11. Mouse Polo - This is one of the TinkerBell Games played in the Pixie Hollow Games movie. It's very similar to polo or lacrosse in that the object of the game is to put the ball (pinecone) into the goal on the opposite side. Pick one goalie (goalkeeper) for each side and have guests take turn being goalie. In this party game use a pinecone for the ball and sticks to get the pinecone into the goal. Use fallen brach sticks or buy huge pixie sticks to use as the game stick. Ir is recommended for safety to roll the pinecone with the stick rather than hit it off the ground. In the movie the fairies and sparrow men ride on mice. Use homemade mouse ears for one team and homemade tails for the other team. Every goal is 1 point and the team who get 5 points first, wins the game. Have prizes for both teams, winning team gets prizes first. If not giving out prizes then winning team gets to pick next game. Note - for little ones a ball might be easier and safer to play with than a pinecone. Guests could use goggles for protection. Want Ideas for your Boxcar?? Watch the video below where you will see a parade of kindergartners in their box cars. Watch this video with your child and let her/him decide what they would like their boxcar to look like. We recommend for the younger guests to keep their box car down to a manageable size and keep the width of the car from being too wide so it is easier for them to move in. There are many different styles and shapes to get ideas from and they are all quite creative. Which One Did Your Child Pick? There are so many choices and ideas it's hard to decide isn't it? Let your child's imagination run wild! The good thing is that there is no wrong boxcar, the bad thing is, you have to figure out how to make it. Tip - Bring home a couple of different boxes and let them "try" it on for size. You might also want to have your child draw the boxcar she/he wants and color it. This way you'll have a better idea. This is a fun project to do together but keep all children away from sharp tools and objects. If you want to keep it in the TinkerBell party theme think along the lines of a TinkerBell car with one of those large TinkerBell wall stickers on the hood or the doors or like her dress with green leaves and sparkle. Sparrow men may think of Terence, Rumble or one of the many other Pixie Hollow characters for ideas. Look at the Pixie Hollow Games movie for inspiration. Their cars are made of natural things found in the forest and some lost things like the comb on Terence's car, the salt shaker on Rumble's car or the gardening shovel on Rosetta's car. There are just so many possibilities and that's part of the fun. 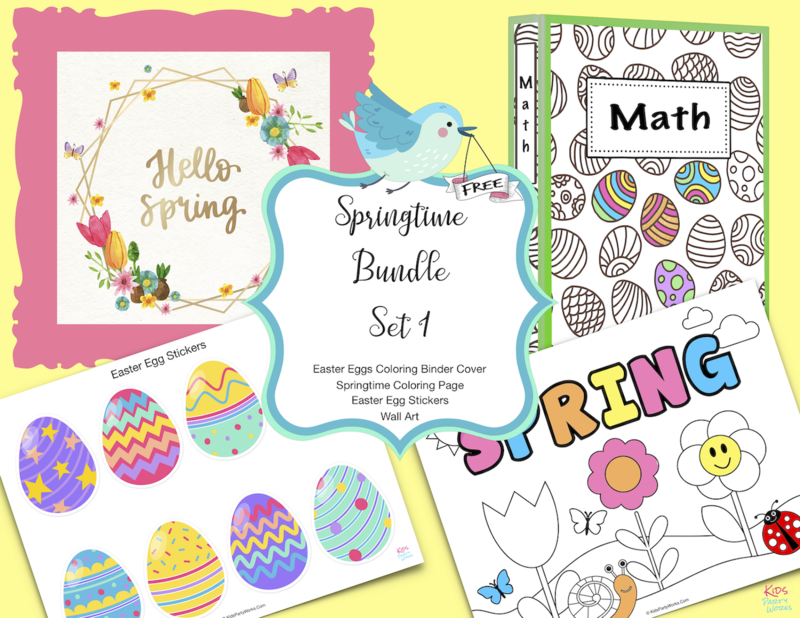 So after you and your child see the video come back for more decorating tips and additional details and instructions on how to play. After you have cut the box into the shape you want this is where the fun begins. Decide on colors, decorations and details. This is a project that you and your child can do together (just keep any sharp tools safely away from those little hands). Keep in mind that you will be making one for every guest, so the number of guests you are inviting is important to know. Make at least 1 car from a slightly longer box to fit 2 guests in case a surprise guest shows up. In the movie, the car racers have 3 chances to pass their opponents. Racers can play it safe on the regular route or take a chance by taking these shortcuts which are a somewhat more challenging. Make up your own "track" depending on the space available. How you play the game is decided by the age group of your guests and the space available. 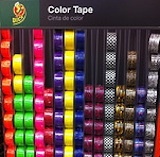 Easy Race - Place colored tape on the ground of the starting line and another at the finish line. If space is small, make the race longer by having the children go to the finish line and then back again to the start line. Show your guests where the finish line is before they start and to begin on the word "go". Wave your checkered flags and begin the race! Pixie five (high five) racers as they cross the finish line and take picture of the racers as they cross the finish line. send their picture with the thank you note. Image courtesy of FtCarconPAO. 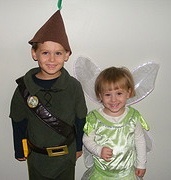 Choose TinkerBell games that are age appropriate and modify the games as needed to fit your age group, space and time. 13. Pin the Fairy on the Flower - This is the traditional "pin the tail on the donkey" game with a twist. This is one of the TinkerBell Games you can make at home or buy ready made online. Homemade - Buy a white poster board and a pack of Disney Fairies and/or a pack TinkerBell stickers. 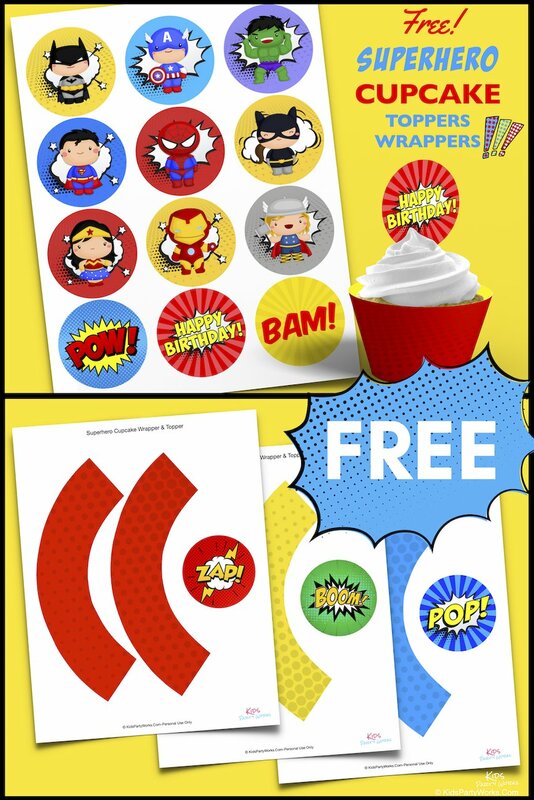 Make sure you have enough stickers for all your TinkerBell party guests. Draw a big beautiful flower with a stem and leaves. 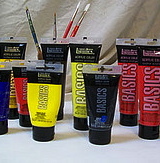 You can use regular markers or poster board markers. Because this game is usually for younger guests make sure to draw the flower big enough to give them all a chance to pin the fairy on the flower. 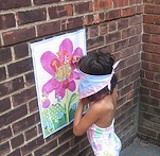 Buy Pin the Fairy on the Flower game which comes ready to put up on the wall and play. Amazon usually carries it but is temporarily out of stock. Visit babyscholars.com (game currently in stock) to purchase the game for $10.76. Image courtesy of flickr-edenpictures. Other Versions - Pin the Tiara on TinkerBell and Pin the Wand on TinkerBell. 14. Lost Things Hunt Version 1 - Instead of giving your guests their party favor or goody bags, turn it into a game. 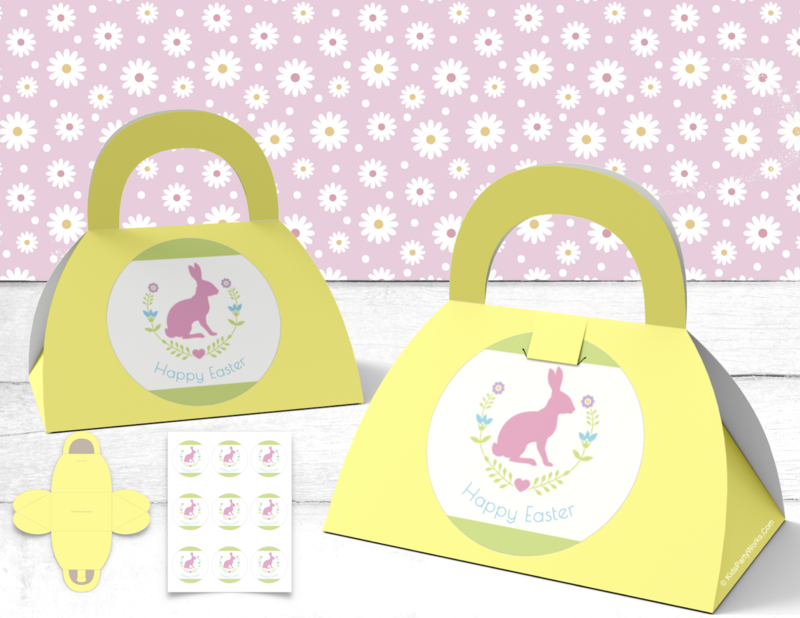 Hide the goody bags and let the guests hunt for them, like in an Easter egg hunt. 15. TinkerBell Bingo Game - If your looking for TinkerBell games that are more suited for just a handful of guests, then TinkerBell Bingo Game is just for you. 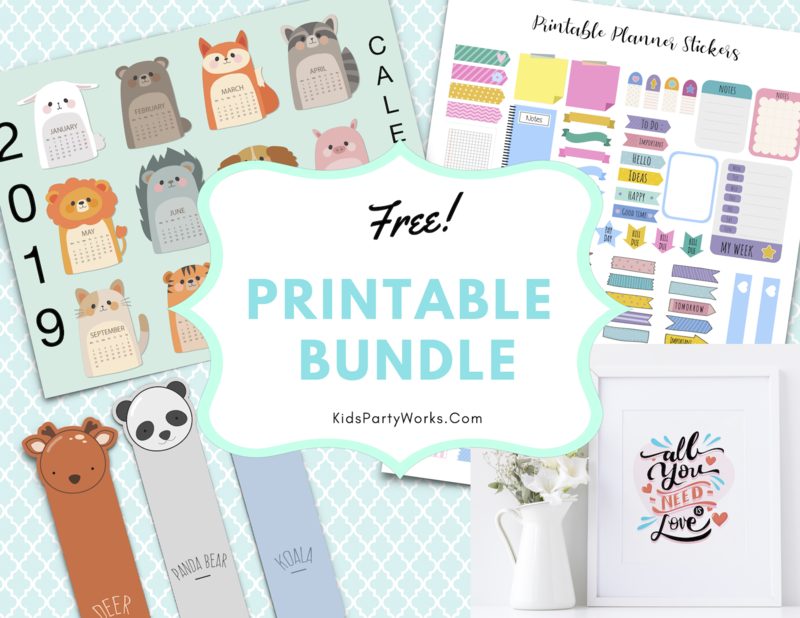 Whether it's homemade, printed or purchased, your guests will have lots of fun playing. To take away the competitive aspect, let your guests know that they will be playing "just for fun". If you are going to give prizes, please have prizes for every guest. There are lots of fun items you can buy at the dollar stores that won't break the bank. 1. Use a ruler and pencil to make a grid-like pattern on cardstock paper or on copy paper and then glue to cardboard (or a cereal box). Make 3x3, 4x4, or 5x5 (shown) TinkerBell BINGO cards. The younger your guests the easier and less squares it should have. Then make copies of the blank Bingo cards. 2. Print and cut your favorite TinkerBell & Fairy Friends pictures, make sure that they fit within the squares you have drawn. Use removable glue so you can move the pictures around to make multiple cards. Put different pictures on different cards so all cards don't have exactly the same pictures. 3. There are many things you can use for BINGO markers, depending on the age. For older guests you can use large buttons, M&M's, coins, etc. For younger children you can use Cheerios, Fruit Loops, Cheese Nips, etc. 4. 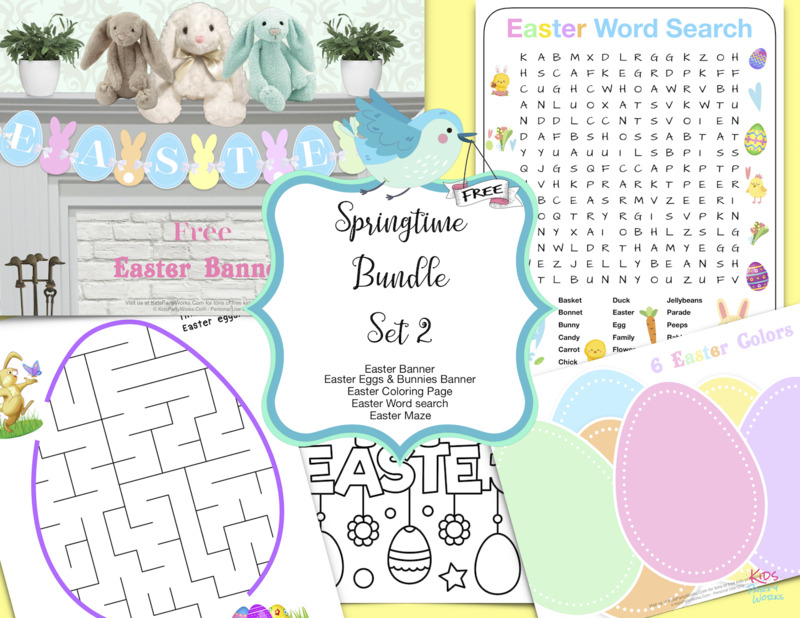 For the call-out pictures, paste all the pictures on cardstock and cut out, place in a hat (Peter Pan) or a plastic flower bowl and you're ready to start playing. 5. How to Play - Instruct your guests on what the winning pattern(s) will be. Blackout Bingo - All pictures must be marked to win. Lines Bingo - Must have a horizontal, vertical or diagonal to win. T Bingo - Must make a "T" shape to win. U Bingo - Must have a "U" shape to win. Squares - Must fill all the outside lines (top, right, bottom, left) in the shape of a square to win. First one to mark the bingo card in the selected pattern(s), gets to shout out "BINGO"! Because we like for all our guests to be winners, we like to continue playing until all children have their turn yelling BINGO. Shuffle the cards, give all your guests a new card and play again. 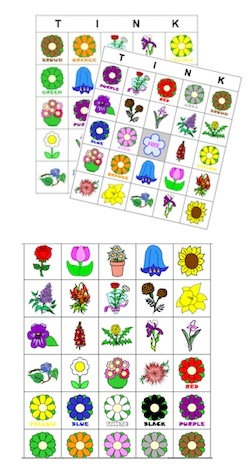 Custom BINGO card printables are fun because they give you options. When my girls were little I used to print these for school classroom party activities and the children had a blast playing BINGO. Select all pictures or combination of pictures and words or numbers. 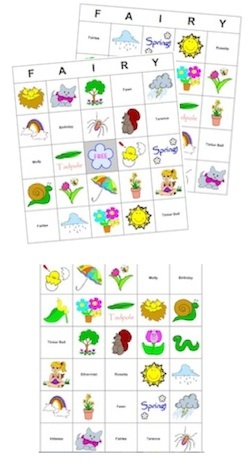 For our TinkerBell games we chose the 5x5 bingo card, chose "flower bingo" (pictured above) or "spring bingo" (pictured right - Notice that the spring bingo cards are both pictures and words, we chose the birthday girl's name Molly, Tinker Bell and the other fairies) under miscellaneous themes, color, all pictures, labeled it "TINK" and print. Then go back one screen and print "call out" sheet and cut. It's that simple. Go to www.dltk-cards.com/bingo and follow the instructions to make your own printable BINGO cards. Then come back to kidspartyworks.com for more TinkerBell Games. Purchase the BINGO TinkerBell Games ( $4.99) which comes with 8 game cards (6"x 8"), cards for the Bingo caller, and pixie dust number markers. Whichever you choose, homemade, printable or purchased, your guests will have a flitterific time playing TinkerBell BINGO. 16. TinkerBell Kids Fashion Show - All dress up games are fun but a TinkerBell dress up game is perfect for a TinkerBell party. Get ready to show off your tiaras, hats, wings, wands or scepters, swords and/or costumes. Wings Fashion Show - Guests can bring their own wings, you can provide wings or they can make and/or decorate wings as a craft activity and then show them off. Tiara Fashion Show - Guests can bring their Tiaras, you can provide the tiaras or they can make their decorate their own tiaras as a party craft activity and then show them off in the fashion show. Tiara and Hat Fashion Show (if inviting girls and boys) - Same as above for girls and the boys can wear their Peter Pan hat, Captain Hook's hat, Terence's Acorn hat, or Sparrow man hat (Minister of Spring), or a pirate's hat. You could also call this the "Tiara and Hat Parade". Music - Have your child help pick out a few good songs to play during the show. Audience - You can't have a show without an audience. If there are enough adults and/or siblings to provide ample applause and cheers then you're all set for the show. Otherwise, line up some children's chairs and place your child's stuffed animals and dolls to watch the show. Videotape the fashion show and play the video for your guests. Everyone loves to see themselves on TV. Make dvd's of the fashion show and send it with your thank you card. 17. TinkerBell's Secret - Have guests sit on the floor in a circle and pick one child to start a phrase like "This party is super flitterific" and whisper it quickly to the child to the right (counterclockwise). Keep going around the circle until it reaches the last child in the circle. Have that last child say the phrase out loud and watch as everyone laughs when they hear the original phrase. Play again only this time start with the child to the left (clockwise). No prizes here, just lots of laughs! 18. Shadow Tag - This TinkerBell game is played similar to the traditional tag, the only thing is you need a sunny day (before or after 12:00 pm) or in a lit room. Before you start, set boundaries of where the children can run. Have all the kids together and pick one guest to be "It". Give the children a 5 second head start by having the "It" player count to 5 then start chasing the other children. The "It" player has to tag the other guests by stepping on their shadow. The first child to get her/his shadow stepped on becomes "It". The game continues with the new "It" player. Play long enough that every child who wants to be "It" has a chance unless there are a lot of children. If your guests are very young, try to keep the game short. 19. 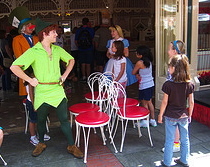 Follow Tink's Trail - This TinkerBell Game is a variation of the "Follow the Leader" game. TinkerBell games like this one are especially fun for a TinkerBell party with young guests. 1. "Follow the Leader" - Patsy Biscoe from the "50 Favourite Nursery Rhymes"
3. "Follow the Leader" - by "The Tinseltown Players" from the "Hickory Dickory Dock" album. 5. 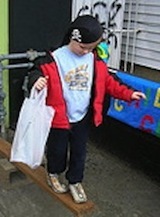 "Follow the Leader" (for older kids)- by "The Hi Nation" from the "Sports Jamz For Kids" album. This song has a fast caribbean beat that is very motivating but perhaps more suited for older children. 1. "Follow the Leader - Kids Cartoon Themes from the "Duck Walk album"
Pick a leader and have the children follow and copy what the leader does. Pick one song that tells your guests what to do and then for variety pick a song that just sounds good for the game. 20. Winter Woods Crossing - This game is a party version of Disney's online game. The season is changing and winter is coming. 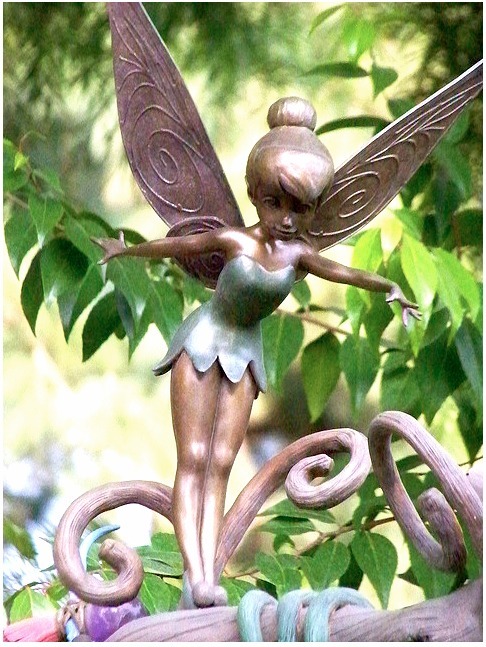 Have children help Tinker Bell and Periwinkle find the lost animals in Pixie Hollow and take them across the bridge to the Winter Woods to prepare them for winter. -Stuffed animals (1 per child) like rabbits and birds (dollar store) or print pictures of animals and glue them onto construction paper. -5 sheets of brown (or favorite color) poster board (dollar store) for the bridge planks. Cut each sheet lengthwise in half to make a total of 10 plank pieces. These will make the bridge that the children and the animals need to cross. Make more if you have more than 10 guests. If the children are very young, cut the poster board into 3 pieces each. -Mark an area by placing masking tape on the ground and some leaves and twigs to form a large rectangle like a bridge. Make sure area marked is as wide as the "planks". For toddlers and young children have 2 volunteers pretend to be Tinker Bell and Periwinkle to guide children along. Explain to the children that the object of the game is to find the lost animals in Pixie Hollow or Forest, find the planks to build the bridge so they can cross into the Winter Woods and prepare the animals for winter. Have children put the planks down until the bridge is complete. Hide animals and "planks" around party area. For younger children make animals somewhat visible. Have children go in search of the animals (have at least 1 animal per child). Let the children know that they are to find one animal and one plank. Have them "build" the bridge so they can get across. Once everyone crosses over, everybody wins! If you want to make the game longer the children can make a pretend winter habitat for their animal, like a nest for the bird. Make sure to have supplies available for this extra step. You can also have animal food which they have to look for like pretend seeds (can use popcorn or little pieces of crumpled of paper). Make pretend acorns by crumpling brown grocery bag paper into balls. Wet paper first so it's easier to for a ball shape. Make carrots out of orange construction paper with green top. Hide the animal food in the "Winter Woods" and have children hunt for the "food". Then place food with animals. Hooray! Everyone is ready for winter. Prizes - Game prizes are not necessary but if you want to give something out, stickers are inexpensive and kids love them. 21. Lightball Challenge - This is the party version created by us here at Great Kids Birthday Parties. Lightball challenge is an Disney Fairies online game where a lighted ball is tossed back and forth much like volleyball but a slower pace, which is perfect for little ones and children's parties. Object of the Game - Just like playing volleyball, one side hits the ball and the other side tries to catch it. If you miss the ball, the other team gets a point. Something to attach the "net" to. Or use string to elongate the tablecloth and tie to tree or other secure object. 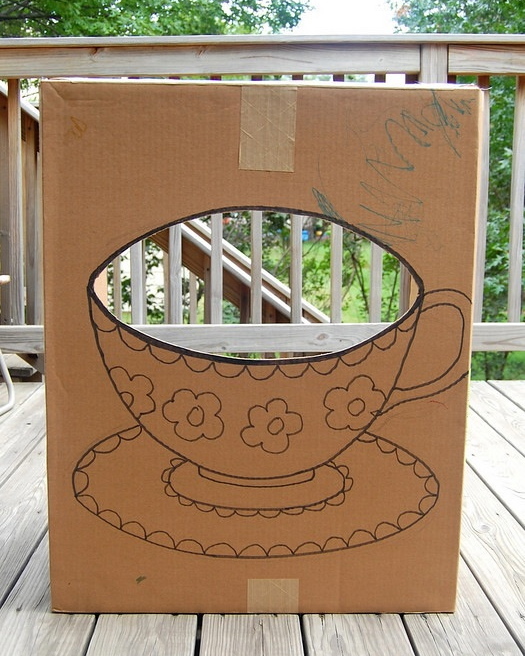 Make a Teacup Photo Booth using a large cardboard box like this one from ikatbag. Draw and color teacup in bright colors and paint the background white or a contrasting color. Add some pixie dust (gold glitter) to the teacup handle like in the movie. Let children poke their heads through like they were in the teacup races. Are you ready to get wet? You will hear a lot of screaming and laughter!! 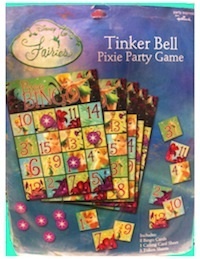 This is one of those games for TinkerBell party that is really a lot of fun for any party. But prepare.................your guests will get wet! Watch this video clip so you can see what we're talking about. I'll explain how to play below, not that you need a game plan because as soon as your party guests see these "Dewdrops" they're going to know exactly what to do. Keep your Kids Birthday Party Checklist and your Birthday Party Supply List handy. Click on both of these and print them free for your use.